Accessorise your look with glamorous Crystalla wrist-wear by Sekonda Editions. Featuring a rich rose tone stone set dial and bezel, and matching rose gold plated bracelet. 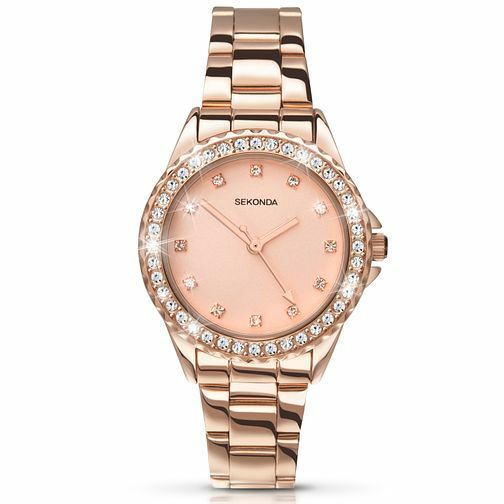 Sekonda Temptations Ladies' Rose Gold-Plated Bracelet Watch is rated 4.5 out of 5 by 11. Rated 4 out of 5 by Anonymous from Looks beautiful I bought this for my mums birthday. She wanted a nice Rose Gold watch with abit of bling after searching for ages I found this one it is not too big and looks elegant. Loved the fact it comes with a warranty and great value for money.